Now, you can learn how to effectively connect your DIBELS Data to instruction to meet student reading goals. Download the workshop flyer for each location for early registration pricing details. Join Susan L. Hall Ed. D., 95 Percent Group and Stephanie A. Stollar, Ph. 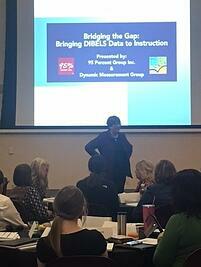 D., Dynamic Measurement Group Inc., for two days of collaborative learning. 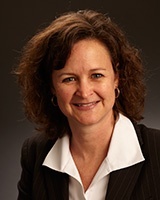 Dr. Hall is the President and Co-Founder of 95 Percent Group and is a nationally recognized leader in RTI, data analysis, and 95 Percent reading instruction. The I’ve DIBEL’ed, Now What? , Dr. Hall will show you how to make the most of your DIBELS reports and implement effective instructional strategies. 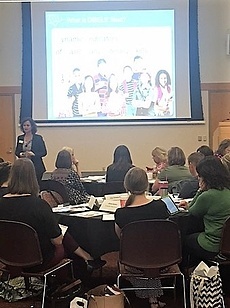 Dr. Stollar is a Professional Development Specialist/Research Associate with Dynamic Measurement Group Inc. She brings extensive professional development experience consulting school districts on the use of direct assessment measures, including DIBELS, to improve outcomes for all students. Here's what your colleagues had to say after attending this workshop. Enjoyed learning how to look at specific DIBELS indicators and apply specific intervention skills. Learning to interpret, discuss and connect data to hands-on instructional strategies was great. The correlation between DIBELS data and 95% data was great! Learning how to interpret it and what to do next was spot on. I have quite a bit of training in DIBELS, and I learned so much. The materials were excellent. Too many take-aways to list! Looking at the data deeply to guide intervention will help our students. All of it! Your knowledge is amazing. Loved the analogies and direct teaching. This session helped me understand how to use DIBELS data in a more meaningful way and to teach along a continuum to meet student needs. Learned how to effectively use DIBELS data to group students and how to teach those groups. Amazing! We use DIBELS extensively and are beginning to implement 95% Group materials, so everything I learned was on point! Loved the connection from data to instruction. So much great info!